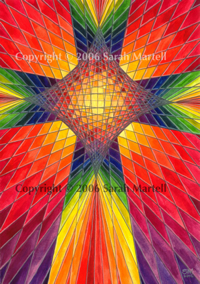 Sarah Martell is a Christian artist who often finds inspiration in the beauty of mathematics. This website has explanations of the maths she has used and selected designs which are available to buy as blank greetings cards. Please let us know which paintings you like. Sarah was one of the 50 chosen artists who painted a Newport SuperDragon in Summer 2010. (c) 2010-2014 Peter and Sarah Martell. Website feedback. Last updated 5/5/2014. Valid XHTML 1.0. Valid CSS.